"The tragedy of the lost generation"
It has been a century since the outbreak of World War I, one of the bloodiest conflicts in history that still has a political and cultural impact in Europe to this day. It is one of the first wars that affected the British home front on mass. This handsomely made period drama sets out to show this as it follows Vera Britain during the war. In 1914 Vera Britain (Alicia Vikander) is a determined young woman who does not want gender roles and expectation to hold her back. She is independently minded and wants to prove herself in hopes of getting into Oxford without help to become a writer. She is close to her brother Edward (Taron Egerton), his friend Victor (Colin Morgan) and soon strikes up a relationship with Roland Leighton (Kit Harrington). But when war is declared, the men sign up to fight and Vera soon follows becoming a nurse. As the war rolls on the causalities increase and personally affects Vera. Vikander gives a great performance as Vera, a head strong woman who wants to prove herself. The more people put her down, whether it's her father, her university tutor, head nurse, or anyone else, the more determined and pig-headed she becomes. Vera has a quiet British stoic reserve to her, unwilling to show her emotions, making any breakdown more potent. Vikander is an emerging actress, best known for her roles in the Danish movie A Royal Affair and Anna Karenina (2012). She has been making a nice niche for herself in costume dramas and plays a similar role to Keira Knightley and Carey Mulligan in movies like Atonemont and An Education. The Swedish actress gave a faultless English accent as she plays this passionate woman, whether it's for her personal goals to her speech at the end of the movie. Vikander is surrounded by a talented young cast who felt very authentic to the time period. They all worked well together, their friendship was believable. Vikander and Harrington were good together in their relationship. Harrington giving a convincing performance as a man signing up to join the army, sacrificing love for his country. He is also notable for showing Roland's trauma when he returns from the war and delivering war poems like "Violets from Plug Street Wood". But because of Harrington's distinctive voice it is hard not to think of his role as Jon Snow. Veteran actors Dominic West, Emily Watson and Miranda Richardson offer support and gravitas to the proceedings. They are their professional selves and West gives an excellent performance as Vera's father who has psychological scars from his own time of military service. Testament of Youth is James Kent's first feature length movie as a director having primarily worked on British Television, with the crime-drama Marchlands being his biggest credit. His directorial style is similar to Joe Wright, having such a classical quality to movies; the material could have been made by Wright. The cinematography by Rob Hardy is breathtaking with many of his shots looking like paintings. There is a contrast between the early scenes that are bright and sunlit in the English summer, framed like romanticism style paintings such as the forest and fields and being muted, wetter and grayer when the war is in full swing. Atonemont was similar showing the bright days of 1935 and then the grimmer reality of war in 1940. The costumes by Consolata Boyle were also of an fantastic standard. 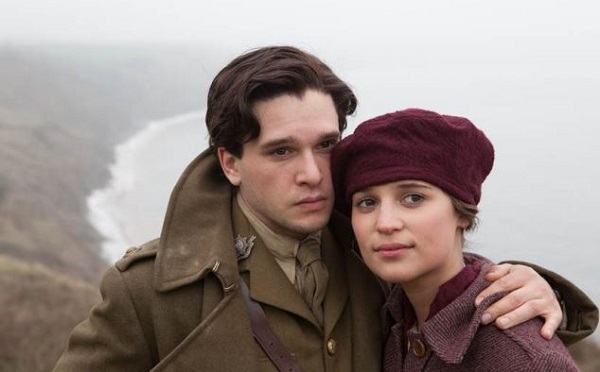 Testament of Youth is well crafted in its themes. There are personal themes of Vera's determination and proving herself to her family, her peers and society as a whole. It was an anti-war movie without having to see any fighting, this is a movie that shows the impact of war from a civilian's point-of-view, Vera's point-of-view. People lose loved ones and Vera sees soldiers coming back with both physical and mental injuries, which hit on wartime issues. It was not just the British that were suffering, but also the Germans. There are moments that will remind you of movies like Gone With the Wind and All Quiet on the Western Front. Vera's generation was a generation that had a sense of duty and service to their country in some way, that the First World War was a worthy cause and that the war was going to be quick. They became the lost generation and as the rest of the country were carrying on with life in some way, they were fighting, dying and suffering for the cause of blind patriotism. For Vera when Armistice Day came it was not a triumph, but a pyrrhic victory. Testament of Youth is a slow burner of a movie that may put some people off, seeing it as slow and boring. Yet it is a classy film, a prestige picture that is in-keeping with a British traditional of quality costume dramas.